5.258 patrocinadores contribuyeron 781.597 $ para que este proyecto se pudiera realizar. 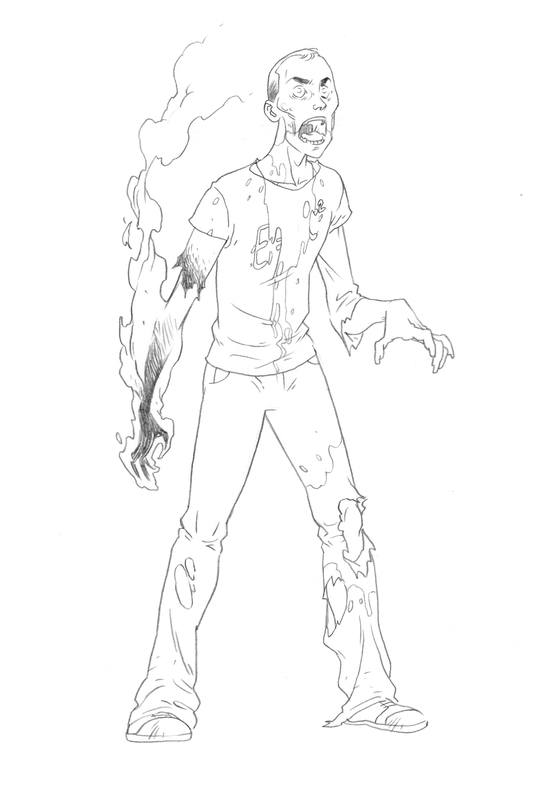 Update: This is what you get at an Abomination ($100) level pledge! Total 114 miniatures! Scroll down for details! (note different shipping times for parts of this pledge). To add optional items just increase your pledge the appropriate amount, and we'll sort out the details after the Kickstarter ends by sending you a survey. We're launching this Kickstarter to drive down production costs by making more copies. If Zombicide is the kind of game that tickles your fancy, then here are the various pledge levels. We appreciate any help we can get! Bitten - Cover lithograph signed by Edouard Guiton, the legendary French concept artist for Confrontation! Walker - Bitten + 1 promo Survivor miniature not available in the base game! Lieutenant Nicholas Walker has sometimes been bad, and always been lucky. Corrupt and cocksure, Nick gets his man, anyway he can, even if it means doing things a normal cop wouldn’t do. Bluffing and bullying his way through the streets of New York, this highly decorated officer has put away hundreds of criminals and lined his pockets discreetly while he was at it. Now, with no more crime and money meaningless, he desperately searches for his wife, rescuing and helping other survivors in the vain hope that someone has seen her. Nick is available for all pledges $25 and over! Runner - Bitten + 2 promo Survivor miniatures not available in the base game! 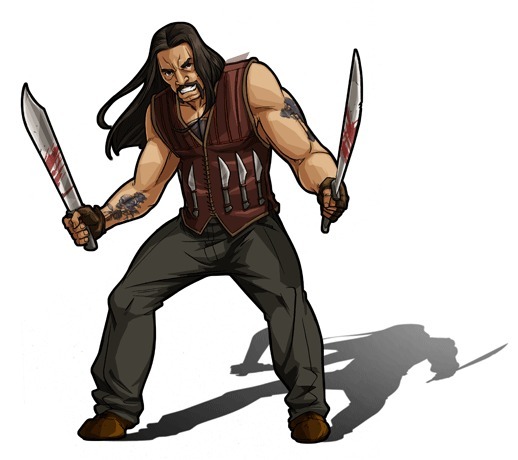 Whether he minds, or even cares is unknown, El Cholo rarely speaks, preferring to let his twin machetes do the talking. 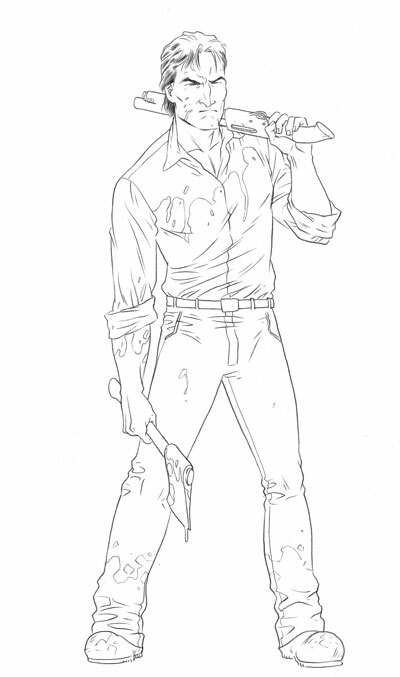 A hardened farmhand or possibly an ex-cartel enforcer, putting Zombies down at close quarters is El Cholo's specialty, and damn! he's good at it. The survivors whisper stories of hopeless last stands and daring raids, and El Cholo walking out covered in (someone else's) blood. Fatty - Runner + copy of Zombicide ($89 retail value). That's a 15% discount plus 2 exclusive miniatures and a signed lithograph! 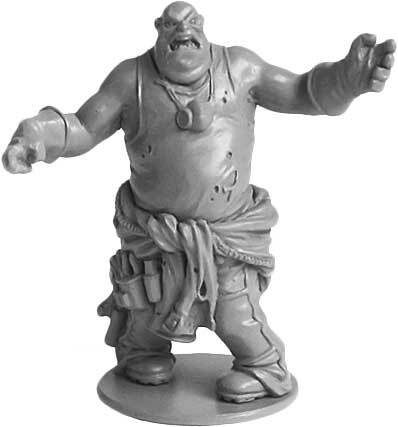 Abomination - Fatty + 3rd special promo Survivor miniature - Dave the Geek and Zombicide dice! 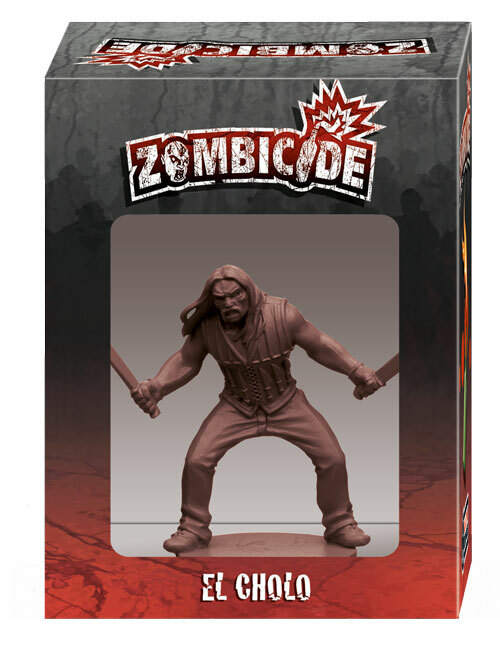 You get a copy of Zombicide and 3 exclusive miniatures and a signed lithograph and 6 custom dice! As far as he remembers, Dave always found reality to be terribly boring. So he locked himself up in an imaginary world and learned piles of useless stuff... useless until now. Dave is a fount of knowledge. His chemistry mastery makes him look like a superhero amongst other survivors. At least until he opens this mouth, then everyone remembers he’s a real geek. Paint The Town! - A hand painted copy of Zombicide, including 3 promo Survivor miniatures and a signed lithograph by Edouard Guiton. This set will be painted by Aaron Lovejoy, multiple Golden Demon winner! I Am Legend - Abomination + Become a Survivor (or Zombie) in the next expansion! Send us a photo of yourself in the modern, contemporary clothes you'd like to be wearing, and a good headshot, and we'll take care of the rest! Important note: For non-continental USA pledges, please add an additional $25 for shipping, and an additional $15 per box for shipping after the first box. We've been totally blown away by the response on Kickstarter, in particular the enthusiastic response to the custom dice! So, if you want another spare set handy, here's your chance to get them! Just increase your pledge the necessary amount, a survey will go out at the end of the Kickstarter asking you which options you want! Some Backers asked for extra custom Black Dice. $10 for 6x Engraved Black Dice. Abomination ($100) and above pledges already include this set. Just add $15 to any pledge! 6x Glow in the Dark Dice. 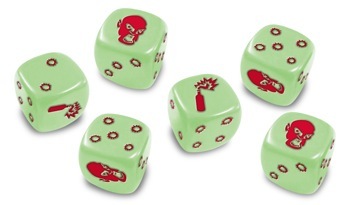 These are the same dice that are included in the $75k stretch goal. But everyone needs more glowing dice right? Duplicate Tiles - Zombicide ships with 9 double sided tiles, so if you get this pack you can lay out all 18 tile designs in one enormous layout! This has a suggested MSRP for $29.99, so get it now at a 30% discount with free shipping! Just add to any Fatty or above pledge! Expected to ship with the main game. Comes with complete set of extra door / car tokens. Who knew that a calculative and cold socialite would survive so well at the end of civilization? Zombie killing is hell on the manicure though.... This sharpshooting manipulative minx can be all yours! Ships with the Zombie Promo Survivors (Q2 2013). You do not mess with Claudia. You do not talk to Claudia. You do not get inClaudia's way. Hire her for $10! 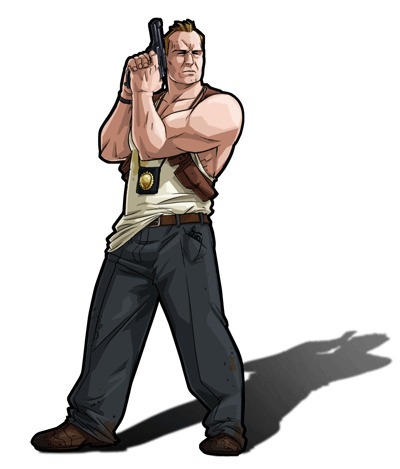 Marvin Redfield. Marvin is a bodyguard, shuttling the rich and famous around. Always a professional, he's used to gently deflecting the advances of neglected wives or wealthy widows.... until one of his clients got a little too aggressive and had to be put down! Now he's up to his eyeballs in mother-f***** Zombies! Get him for $10 added to any Abomination level or above pledge! Ships the same time as the Zombie Promo Survivors! Eva Duran - She's got a sword, and she knows how to use it! 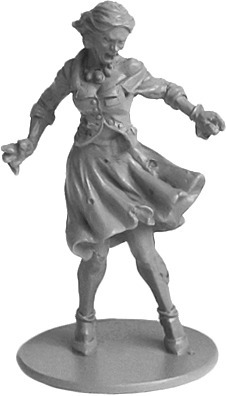 This kickass Survivor is something we'll start sculpting now and ship to you at the same time the Zombie Promo Survivors go out! Just add $10 to your Abomination and above pledge! Paint the Town includes these trays. Since we're doing them anyway, we thought some of you out in Kickstarter land might want some. 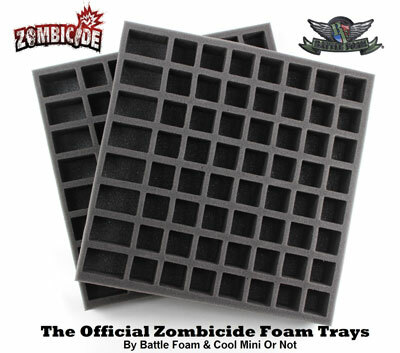 So, if you want to paint your great Zombicide miniatures and still want to transport them around conveniently, this might fit your needs.These trays will be available for sale from Battlefoam later, just that shipping is free within the USA if shipped with your Abomination or above order. Outside the USA, please add $15 per set (sorry, these are bulky). $40 for a set of 2 trays. 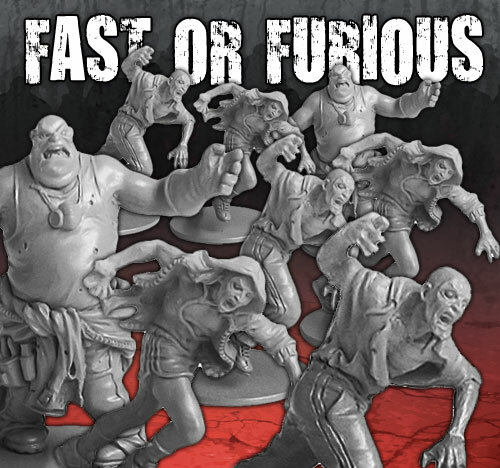 Just add the appropriate amount to your pledge if you're interested (Manage Pledge, green button on the Zombicide Kickstarter page) and we'll send you a survey after the Kickstarter to confirm your options. Bios - who the heck are you guys? 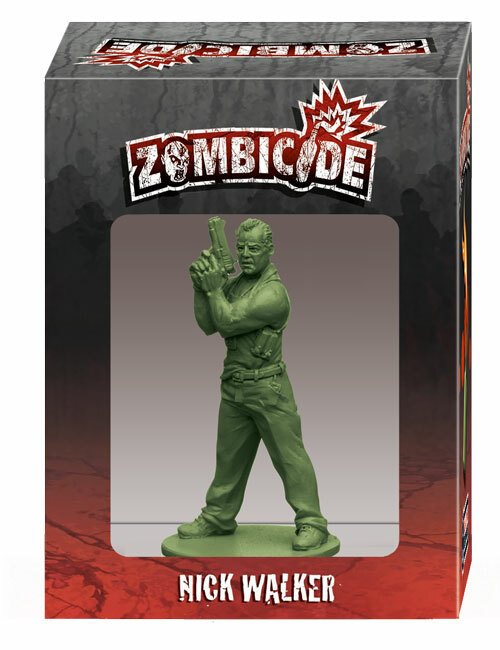 He is the executive producer of Zombicide and from time to time he has one or two good ideas that are systematically ignored. Thanks for the great support everyone! Here are the stretch goals since we're 100% funded! Achieved! Everyone who pledged Abomination and above ($100) gets a great red T-shirt per Zombicide setwith the Zombicide logo printed on it! Show off your good taste in games with this great looking T! Achieved! 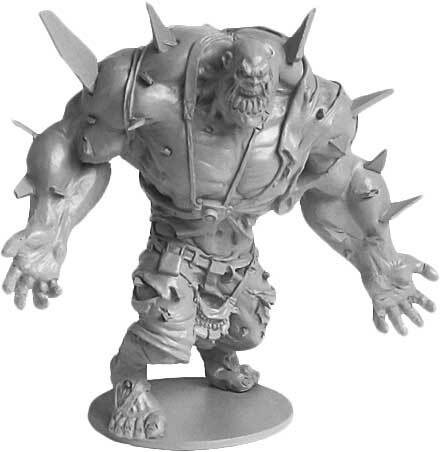 Get two additional Fatties in each Zombicide set if you pledged Abomination ($100) or more! That's a lot of lovin'! Achieved! 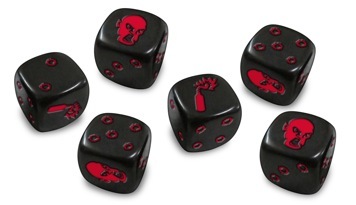 Everyone who pledged Abomination and above ($100) gets an extra set of 6 GLOW IN THE DARK custom dice per Zombicide set! Achieved! Get an additional Abomination for each box game for pledges at Abomination level and above ($100)! The regular set only comes with one Abomination, throw in another one to give your Survivors a real challenge! Achieved! Everyone gets a downloadable campaign, culminating in a scenario that will see the use of all additional promo Survivors, Fatties and Abominations! This will include a downloadable map tile, scenario rules and off the hook action! Achieved! Everyone who pledged Abomination and above ($100) gets three (one each) of the Zombie promo figs when the expansion is released (ETA Q2 2013). That's right folks, Zombie Nick, El Cholo and Dave! 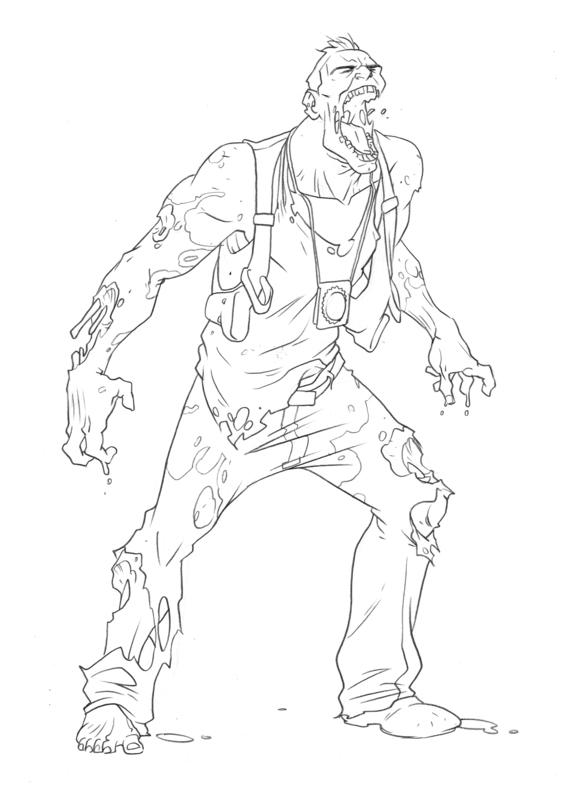 We'll send you all 3 playable promo Zombies not available in the expansion when it's released! Achieved! Fast or Furious! Get 2 extra Fatties and 6 extra Runners per boxed game if you pledge Abomination or above ($100)! Achieved! Walk of the Dead. Classic Romero-esque Horror! 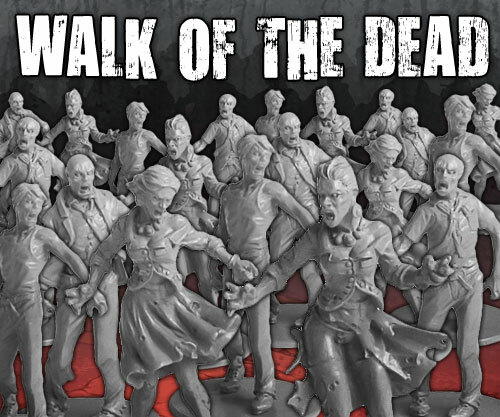 Get 12 additional Alert Cards with just Walkers..... and 20 additional Walkers just to round things out per boxed game if you pledge Abomination or above ($100)! Learn to fear the slow and predictable! Achieved! Downloadable Map and Scenario Editor! Everyone gets this release, so you can easily create your own scenarios/maps using the same editor we used to create the scenarios in the game! The editor will include map tiles and component graphics, so put your designer hats on! Achieved! Plastic trackers! Every game gets plastic trackers for Survivors! If we hit this stretch, we'll pay for a new tool to get these nifty trackers that clip on to the Survivor IDs. Shout out to the peeps that suggested this at Adepticon! Achieved! If we hit this we'll sculpt Zombie Eva and anyone who purchased Eva gets the Zombie version of her free! Shipped at the same time as Eva! Achieved! "Eagle" Chaz - A true American Hero! If we hit this stretch, all Abomination and above level pledges get him free! "Eagle" will ship at the same time as the Zombie Promo Survivors (ETA Q2 2013, might be sooner, you never know with the "Eagle").1 Eagle per boxed game. Achieved! Zombie "Eagle" - Say it ain't so! "Eagle" can't be beaten! Except, perhaps, by the massive Kickstarter hordes! If we hit this stretch, Zombie "Eagle" is free for all Abomination level and above pledges. 1 Zombie "Eagle" per boxed game. Ships together with "Eagle". Achieved! 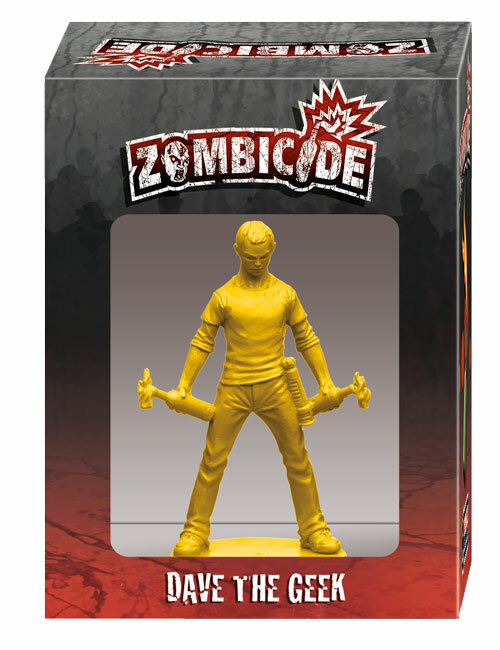 This is the official Penny Arcade Cardboard Tube Samurai: Zombicide edition, and his counterpart, the Zombie Cardboard Tube Samurai. If we hit this stretch, everyone who pledges Abomination and above ($100) will receive both versions for each boxed game! Ships together with the Zombie Promo Survivors (est Q2 2013). 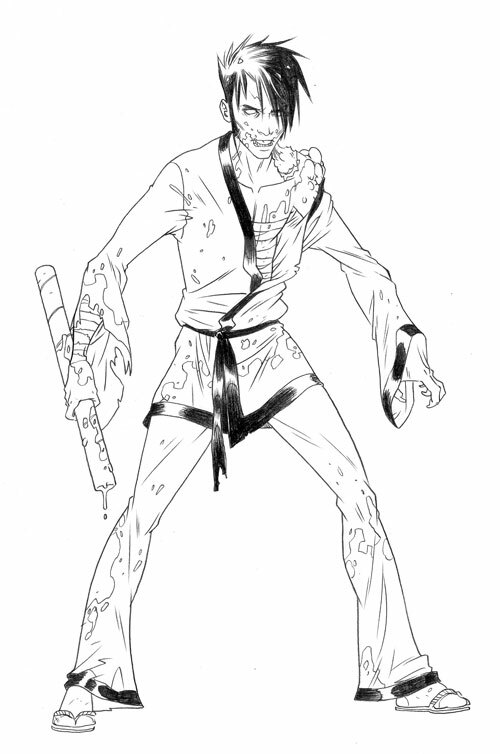 The Samurai and his Zombie self will also be available at future PAX events. So you know, no pressure. 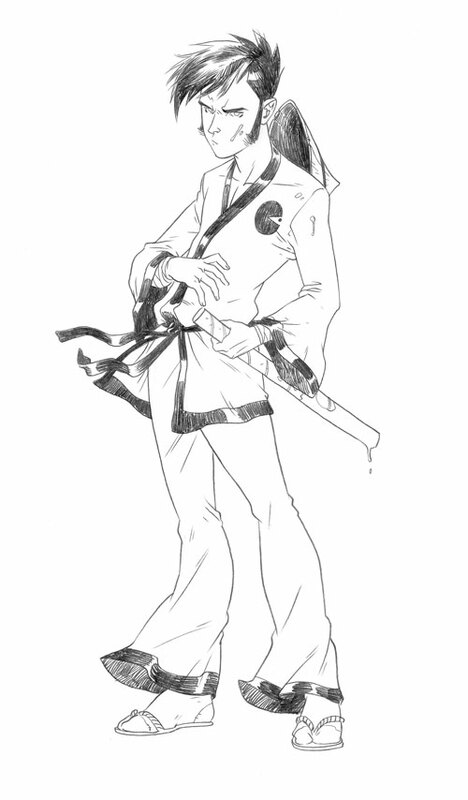 Here's the concept that will go for sculpting if we hit our goal! Concept by Jacopo Camagni! Achieved! 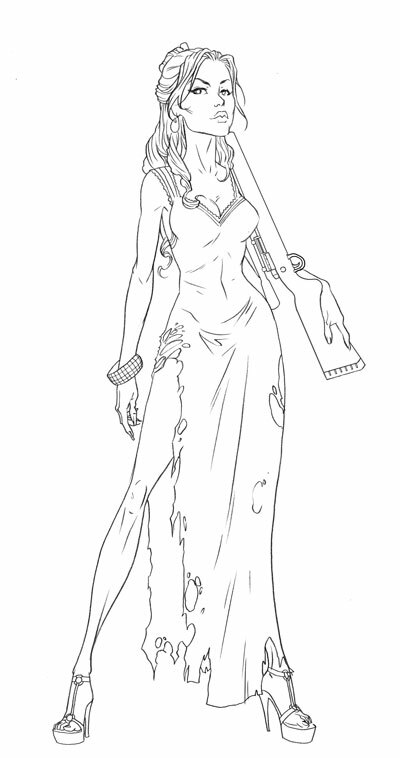 If you pledge for Ivy, get Zombie Ivy free when we hit this stretch! 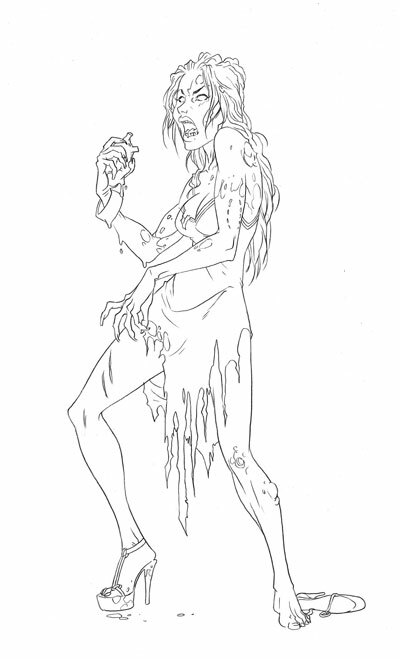 If you pledge Claudia, you get Zombie Claudia free! Ships together with Ivy and Claudia, respectively. 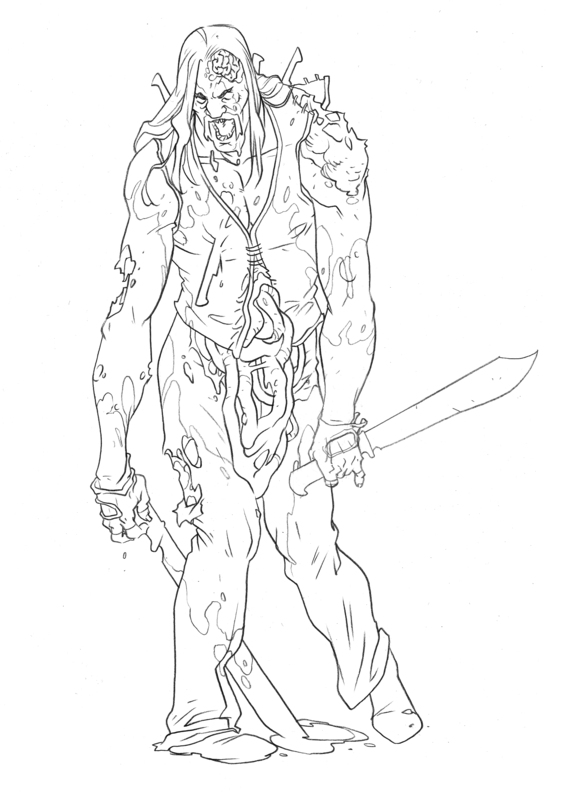 If we hit this stretch, everyone who pledged Abomination ($100) and above will get Troy and Zombie Troy! Ships together with the Zombie Promo Survivors (ETA Q2 2013). This is our final, honest to god, cross our hearts and hope to die, stretch! Thank you everyone for your enormous support! From both the CMON and GG teams, we are incredibly grateful!